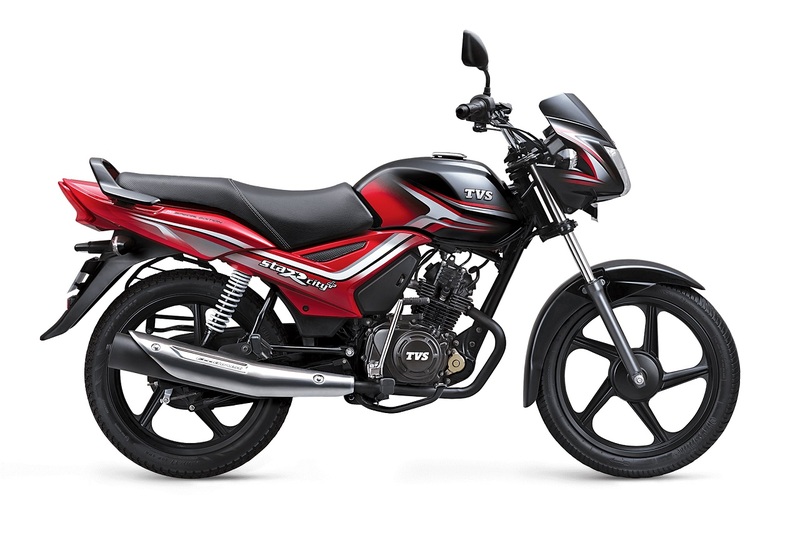 TVS Motor Company has launched a new dual tone variant of the TVS Star City Plus in India at a price of INR 50,534, ex-Showroom Delhi. The variant comes in a Red and Black dual-tone paintjob. The colour variant gets a black and red paint finish with premium 3-D chrome badging. The grab rail is finished in black as well. The mechanical underpinnings of the bike is the same as the standard variants. The motorcycle employs a 109.7cc single cylinder Ecothrust engine with Molycoat piston for reduced friction and increased combustion efficiency. It outputs 8.4 PS of power at 7,000 rpm and 8.7 Nm of torque at 5,000 rpm. The engine works in tandem with a 4-speed gearbox. The fuel tank can hold 10 litres. The claimed efficiency of the bike is 86 kmpl. A telescopic fork at the front and a 5-step adjustable hydraulic shock absorber at the rear suspend the single cradle tubular frame. For braking, the motorcycle features a 130 mm drum at the front and a 110 mm drum at the rear. High Grip Tread Button tubeless tyres wrap the 17-inch alloy wheels. Mechanically, the bike is the same as the standard variant. Instrumentation includes an analogue-digital combo cluster, with an Econometer for an optimum mileage-power balance. There is a service reminder as well. The Star City Plus tips the scales at 109 kg, kerb. The base variant (kick start) of the Star City Plus costs INR 45,390, ex-showroom, Delhi.